Construction of a US$20m hybrid Hotel and Shopping Mall is taking shape on Mandela Avenue and is expected to be completed by late 2018. Foundation works for the R&S Investment Inc’s “Orchid Garden and Mall” started in 2015, next to the Chinese Embassy and steel frames have been erected for the six-storey building. 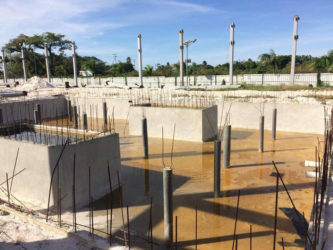 Managing Director of Operations, Charles Wallerson told Stabroek News last week that the US$20 million investment was initially pegged at US$10 million but stakeholders reviewed the project and a decision was taken for the inclusion of a hotel. President of the China Trading Company here, Jason Wang explained that the principals are the China- based Weiye Group of Companies, Beijing R&S Sign and Technology Company and his China Trading. An artist’s impression by Aqua Sun Design of the Orchid Garden Hotel and Shopping mall when completed. He informed that it was he who solicited investors for the project and that initially five companies showed interest and had committed. However, sometime last year, two of the companies pulled out and he is currently still scouting potential replacements for the project that should be completed in two years. Funding for the project will come from China’s Industry and Commercial Bank and the representatives here are also looking for a local bank to facilitate its business from this end. “R&S Investment Incorporated, a company incorporated under the Guyana Companies Act, has a project to build and manage Orchid Gardens Hotel & Shopping Centre. The hotel will be a three star hotel offering luxury accommodation with associated amenities to local, regional, global tourists and business travelers. In addition, a shopping centre will be built within the structure that integrates the hotel and the shopping centre as one structural unit,” a business proposal from the company states. 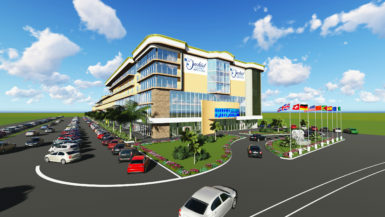 “R&S Investment Incorporated intends to be part of this tourism development agenda by investing in the building of the premier Tropical Gardens Hotel and Shopping Centre that will provide jobs, economic growth and add to the attractiveness of Guyana as a tourist destination with world class hotel and shopping services,” it adds. The company says that not only does it want its facility to be one of the most appreciated hotel and shopping centres in the Caribbean but that it will be a model for others given the employment and other plans it has. 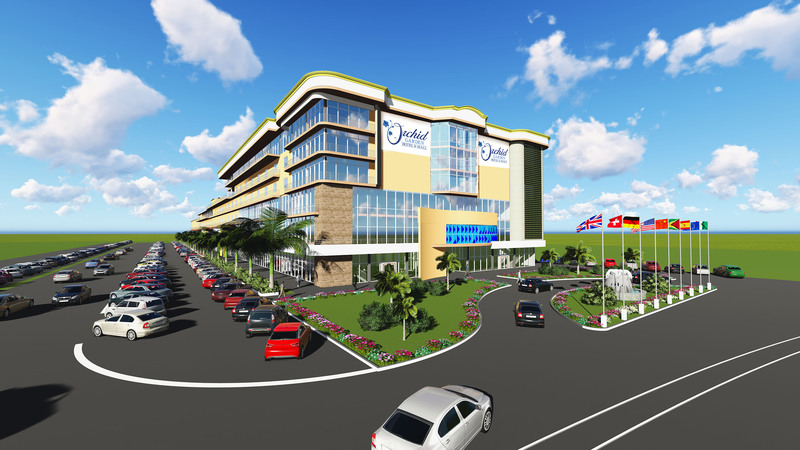 Orchid Gardens Hotel and Shopping Centre intends to provide employment for approximately 150 Guyanese during its construction phase, which will last for three years. In the long term, it hopes to create employment for over 635 persons. The company says that it will partner with training institutions as it aims to enhance its services thus not only exposing its staff to international standards but equipping them with needed skills for their respective jobs. The front section of the more than 40,000 square meters project has been designed to house six floors while the back would accommodate four floors which would be used for the shopping complex while the upper floors would house a 150-room hotel. Wallerson explained that they decided to work on the hybrid project since it was realised that such a facility is not available in Guyana. The director of operations added that the shopping centre has been designed to house approximately 50 stores. The project includes roof gardens, conference rooms, restaurants, movie theatres, food courts, play pens and a park, a gaming centre, a tourism centre, a medical facility, laundry mart, gym and parking area. All facilities would be open to the public. By 2017 construction of the project is expected to speed ahead, Wallerson said. He explained that due to the design changes there were some delays and they would have to reapply for duty-free concessions from the government. And how does the hotel intend to keep its occupancy rate at the maximum? Orchid Gardens says that it has a comprehensive strategic marketing plan that would see daily averages between 50 to 80 percent year round. It is expected that at peak seasons those numbers would rise. “Our target market will be primarily North American …and the European tourism market…However, we are very keen on forging …partnerships with our border countries. We have a strategy that involves working with the relevant tourism stakeholders and associations in both Suriname and Brazil because of accessibility to Guyana,” the proposal states, while pointing to the statistics that Surinamese visitors number about 30,000 annually. The complex, Stabroek News was told, would be equipped with a hybrid power system comprising solar energy and electricity. The mall would also be equipped with three open spaces for natural light and three reservoirs which would hold more than 80,000 gallons of water in each. The company would not be depending on the Guyana Water Incorporated to provide services since they have dug two wells which would supply their needs.